A big thank you to our long time partners Caring and Living as Neighbours (CLAN) for their ongoing commitment to supporting Wishbone Day communities worldwide. Awareness makes a difference! Take a look at this short report published by CLAN on the launch of FOSTEO Indonesia. 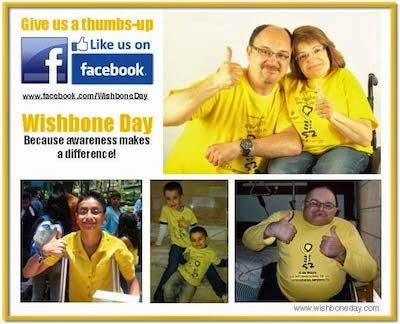 Wishbone Day 2014 will be the next “big event” in the FOSTEO calendar! The members of FOSTEO will work with Dr Aman Pulungan and his team, and also link in with the broader international OI community to plan their first big Wishbone Day! We can't wait to celebrate together on May 6th, 2014. Wishbone Day is growing stronger every day. How will you celebrate? Leave your comments below or join us on Facebook or twitter.